Itaewon is the place every tourist goes to. The regular foreigners avoid the place life the plague…. Well, not the young and drinking crowd. None of us way good here, who are truly interested in culture, like Itaewon. It’s loud, rowdy, and full of drunk westerners. Still, on occasion you find yourself there because it ends up being the most convenient place to meet up with people. It does have an ally high concentration of restaurants, some of sick you won’t find anywhere else. I guess it’s an OK place if you are feeling homesick because you can get your fix of McDonalds, Burger King, KFC, Outback, Subway there. Plus a million other street stalls to buy over-priced ‘Korea shirts’ (as it was shouted to me once). Here is a fine example of such great things you can buy there. Some things I have seen here are like “wow, why the heck haven’t we done that yet?” and others are like “I hope to God they never do that!” This is one of those “Huh?” things. Motion Sensitive Symphonic Music player. Now, if you are easily offended, don’t’ read past this line. As amusing as this might be, even somewhat gruesome deep down, there is some truth to that statement. 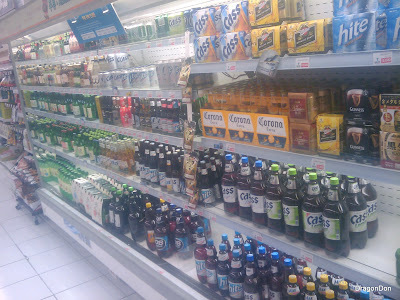 Koreans go well beyond conservatism when it comes to home comforts in public places. In public schools, only the classrooms are heated. The hallways and bathrooms are the same temperature as outside. 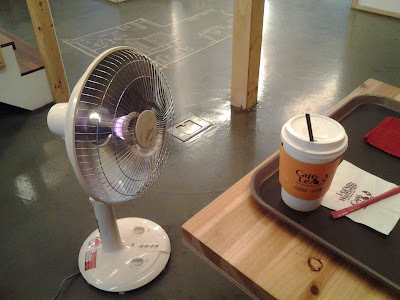 When you go to small owner cafe shops, you get personal heaters. Don’t believe me? So, despite the joke that could be construed as seemingly cruel, there is a spark of truth to it. This is reversed in the summer sorta. Despite GOVERNMENT HEAT WARNINGS, they will still keep school open, along with the windows, and not run the AC. They just take conservatism too far IMNSHO. Apps for your smartphone that keep track of how long you have been dating, pictures of you and special events. A friend of mine showed me one such app and I was stunned. The younger generation really takes their dating seriously. I’d call it OCD in many cases. OH the stories I have heard. One guy came home to find her girlfriend in his apartment. When he asked what she was doing there she replied “I just cleaned up the place and was going to make supper.” Sure, this all sounds great but when he told me “I then asked her how she got the door code, she said she just watched me punch it in.” along with “I’ve cleaned up many times.” Anyone else currently hearing the psycho dramatic music right about now? 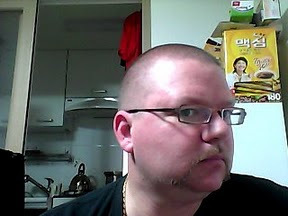 I got my first haircut in Korea. I reallllly need to work on my Korean as well as not assuming that hair-clipper setting #3 in Canada is NOT the same as clipper setting #3 in Korea. 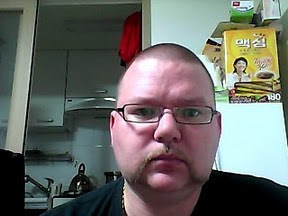 I’m no “Ox Baker” but I’m sure he would approve. I think I now have more hair on my face than on my head. Ah well, in 4 months, I’ll be able to get another trim….just not this short. Like all of the US, and some parts of Canada, they sell Alcohol in all their stores. This is our local grocery story (GS Supermarket). By far, Soju (Rice-based alcohol) is the cheapest. Typically around $1 a bottle and has an alcohol content of about 20%. I tried a little shot of it awhile ago, not terribly pleasant and it easily explains how easy it is to get drunk over here. And here we see the first real snowfall of the year. The snowflakes are huge. No the picture is not zoomed it, this is my ‘view’ out our window. I can almost touch the next building. While we don’t have Tim Hortons, we do have Dunkin Donuts and Starbucks. This, I believe, is the first Starbucks in Korea to use the Korean script (Hangul) in its title. This one is in Insadong. Western food chain stores continually expand over here. This is Korea’s first Taco Bell in Itaewon. And right by it you have Quizno’s along with Cold Stone Creamery. I have had one and almost a second bad experience in Quizno’s (One in Canada and the second here). I’ll just avoid them in the future. Itaewon is a major tourist/shopping area. They have a TON of street vendors all with these large carts. Here you see them taking them from their parking location to their street spot. They all have little electric motors to help move them. Let us not forget the ubiquitous Hard Rock Cafe. A side note on this. The Hard Rock cafes have a saying on each building that says “Love All. Serve All.”, this one does not. I continually try to meet new people. One of the guys I have met is in the US Military (there are a whole bunch of US bases here). 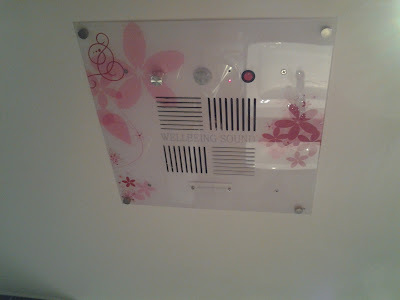 If you are married and have a child, you can get a bigger and much nicer place. He lives in an apartment building but his place is two stories. It’s rather large (I would dare say bigger than our house from Hamilton) but just no backyard. It’s very nice, lots of wood used in decorating, and not the cheap wood either. That being said, the view off his porch gives a bit of an idea of what housing/apartments are like around the Itaewon area. Can you spot the white bunnies on the rooftop? Not gonna speculate on what they being used for, but who knows. I know of some foreigners who keep bunnies as pets here. Karaoke is huge in Korea. So much so that it is to the point of having places that rent out rooms by the hour with large TV screens and speakers, 2 microphones, bright flashing & lazer lights decking it all out. The cost is relative to the number of people going into the room, the more the people, the higher the cost. On Friday night we had 11 people and the cost was $28/hr. Cost per person is rather cheap and it was all good fun. Unlike North American places, you are quite allowed to bring in your own food & drink, in fact, drinking & karaoke are a social norm in Korea. Some people simply went across the street and bought some cans of beer (Case and & Hite) from the corner store. We all took turns singing (except for the 2 Indian guys…who coincidentally were the promoters of beer and buyers of Soju shots). After each song, the computer rated your ability on a scale of 1 to 100. I think the lowest score was 86. I’m am pretty sure the computer was biased and/or tone def. 2.5hrs later, and we were all thinking on moving on. There was talk of going to play ‘electronic darts’ which sounded good but I was getting pretty tired and so what Bharati. So we said our goodnight and grabbed the bus home. First up: Mountains. While this pic isn’t the greatest shot, it does give you an idea of what you can see by simply walking out your front door and looking down the street in many areas of Uijeongbu (not to mention pretty much anywhere in Korea). Besides being a geek, I am also a car guy. While in Korea, I am fascinated by the cars here. The Koreans have evolved their styling way beyond ‘cheap asian cars’ and ones that I highly anticipate owning due to the simply awesome designs. But this picture ain’t about that. Besides finding it very interesting to see North American cars over here, this one simply has to be shown. When I was here 3 years ago, I saw a couple of 300C’s and they were all diesels. This one was not and from the sound of the touted up exhaust, it was a 3.5 V6 at best. But the GUY driving it was all tough and with the bumper-to-bumper traffic, he waited back so that he can simply floor it and annoy everyone else around him. It was a painful part of the morning. Now this I found to be both highly amusing and infinitely practical. Instead of overpaying some city worker to stand there and warn traffic of the obvious, why not have a fake guy waving people a warning light? Smart idea that I think. Itaewon is a very large tourist shopping area. With that comes all kinds of street vendors and massive numbers of stores. A friend of mine collects belt buckles and there was one vendor who specialized in them. These are actually lighters but certainly to raise some questions with authorities when spotted. A Knife buckle and a skull with multi-coloured flashing eyes. While purveying the many fine wares, I saw this cool hat with a Dragon on it (go figure eh?). When I asked how much, he said 18,000KRW (about $18CDN). I decided it wasn’t worth that much and moved on. I saw the same hat again at another vendor and got told 12,000KRW. That was a more reasonable price so I grabbed it! Seems to suit me quite well I think! Of course with all the tourist stores and food, there were bars. This one had a cool Greek name, which should have been an indication of what was to come. On the side was a more description of who their clientèle is. Further down Insadong there were these girls giving out free hugs. It wasn’t much of a hug really. In Korea, unfamiliar men and women do not hug. It’s very awkward for them and so was this so-called ‘free hug’ that I got. But hey, thought it was rather amusing and decided to give it a shot any ways. A little later on and the Lantern Festival was underway. I was able to clear out a few pictures to make room for these. Hopefully net year we’ll be able to get more pics of them. You will note that the pictures were taking from above. We were at street level and there was a walkway beside the river. There was a huuuuuge lineup to go down the stairs to the walkway. Maybe we’ll get there early next year to get closer and more pictures.